Wednesday, April 25, 2018 at 7:00 p.m.
One of the most prominent sculptors of the 1980s, Scott Burton’s (1939–1989) functional, participatory works were welcomed into public spaces [including Buffalo's Allen/Medical Campus subway station] and museum collections during the decade. These sculptures were built upon his previous work in performance art and its queer engagements with themes of social and personal space. In this lecture, David Getsy will chart the strategic camouflage Burton deployed in the 1980s as he started making public art and navigating its institutions. Burton’s aim was to create an anti-elitist and democratic form of art, and his aspirations were inspired by queer and feminist critique. His deceptively simple sculptures infiltrated public and museum spaces successfully, but they also register the impact of larger political realities of the AIDS crisis and the 1980s Culture Wars. This lecture will discuss the obstacles to being a queer artist making public art and track both the personal and art-theoretical stakes of Burton’s attempt to make works that transcended barriers of class, that performed a queer critique of social space, and that modeled democratic and egalitarian relations. 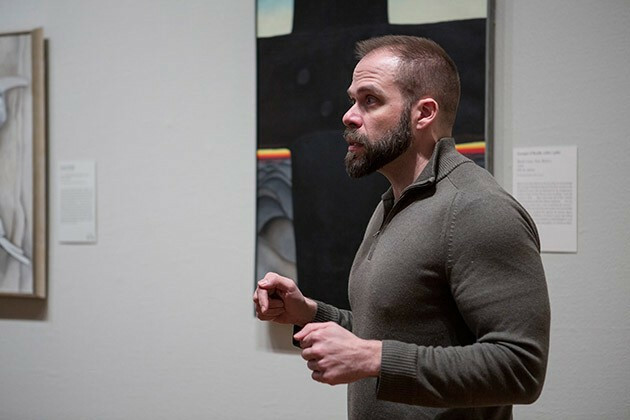 David J. Getsy's scholarly work has been informed by over a decade of teaching at SAIC in a research-oriented academic department in an art school context. He teaches and writes about modern and contemporary art in Europe and America from the late 19th century to the present, and his emphasis has been on art's histories of the human form and its alternatives. The questions he asks of the history of art are developed from engagements with the interdisciplinary fields of transgender studies, queer studies, game studies, and performance studies. From his work on 19th-century sculptors such as Auguste Rodin to his research on contemporary art and performance, a central concern has been the ways in which artists have used sexuality as a resource in their development of public modes of practice, pluralistic accounts of sociality, and accessible artistic vocabularies. Similarly, his research draws from transgender studies as a means to excavate the competing accounts of personhood that underwrote histories of figuration and abstraction. This is the theme of his last book Abstract Bodies: Sixties Sculpture in the Expanded Field of Gender, which is the first book-length study in art history to engage extensively with the field of transgender studies. He is currently working on two major projects: first, a monograph on Scott Burton's performance art of the 1970s, sexuality, and the emergence of new modes of public art in the late twentieth century. Second, he is preparing an exhibition on the largely forgotten career of Stephen Varble, who staged genderqueer guerrilla performances in the streets of 1970s New York. Abstract Bodies: Sixties Sculpture in the Expanded Field of Gender (New Haven and London: Yale University Press, 2015). Introduction [PDF]. Click here to read about: Scott Burton at Hallwalls, January 17–31, 1977. "Scott Burton (June 23, 1939–December 29, 1989) was an American sculptor and performance artist best known for his large-scale furniture sculptures in granite and bronze [including his 1979 public art installation in a Buffalo subway station, see below].…Burton died of complications due to AIDS at Cabrini Medical Center in New York City. He was survived by his partner, Jonathan Erlitz, who died in 1998." "In 1979, an art selection committee was created, composed of NFTA commissioners and Buffalo area art experts, that would judge the artwork that would be displayed in and on the properties of eight stations on the Metro Rail line. Out of the 70 proposals submitted, 22 were chosen and are currently positioned inside and outside of the eight underground stations. "Allen/Medical Campus station [was, until recent major reconstruction to accommodate the new UB Medical School] the home of four pieces of work, from Richard Friedberg (NYC), Scott Burton (NYC); Charles Clough (NYC); and Alberto Cappas, Juan Gonzalez, and Olga Mendell of the Latin Gallery (Buffalo). * Richard Friedberg's offers an objective sculpture made of aluminum and steel. It is polychromed with highly durable paint and high gloss coloration. It is located on a wall over the escalator between the mezzanine and the level between the mezzanine and train platforms. Charles Clough offers riders a large photographic mural based on the work of Charles Burchfield, Buffalo's most famous painter. The Latin Gallery group offers riders a wall located along a sidewalk at the south end of the station in bright colors, and containing selected excerpts from chosen poetry. The work is on colored enamel fused to copper tile. Though subtle, Scott Burton offers riders a pair of bronze benches located in the middle of the mezzanine near the ticket vending machines. The two benches pay tribute to the American Arts and Crafts Movement. The benches represent uptown and downtown directions to the station. [Both] benches are life-sized and invite participation by passengers sitting [on] them." *UPDATE AS OF APRIL 19, 2018: While Clough's piece is still in place down at platform level, the artworks by Friedberg, Burton, and Cappas/Gonzalez/Mendell were necessarily removed during the process of drastically reconstructing the new station at street level to integrate it into the new UB Medical School, and a new site-specific sculpture by Shasti O'Leary Soudant was installed in the rebuilt station entry in 2017. The Cappas/Gonzalez/Mendell work had been previously damaged by both vandalism and weather before its removal for station reconstruction, and requires extensive conservation before it could be reinstalled elsewhere. The massive Friedberg piece is also currently dismantled and in storage pending possible relocation to another public site as yet unidentified. I just heard back from Tom George, our Director of Transit, and he let me know that the benches [by Scott Burton] are currently located in storage at our Utica station; we plan on locating them at street level at that station in the near future. I will be happy to keep you informed as to the status, and provide you with as much lead time as possible. Have a great evening. FINAL UPDATE: As of December 2018, Scott Burton's Roycroft-inspired bronze bench scuplures are reinstalled at Utica Station.